Every year more than 795,000 people in the United States experience a stroke – that’s one stroke every 40 seconds. Stroke is the fifth leading cause of death in the U.S. and is a leading cause of disability in adults. Recognizing symptoms early and getting treatment quickly can make a big difference when it comes to both surviving and recovering. Baidwan and the entire stroke team at SNMH are committed to not only caring for those affected by stroke but working with the community to increase understanding about stroke. “When it comes to stroke, every second counts,” says Shannon McCrea, BSN, RN, CCRN, SNMH Stroke Coordinator. Stroke occurs when a blood vessel to the brain is either blocked by a clot (ischemic stroke) or ruptures (hemorrhagic stroke). When this happens, part of the brain stops getting the oxygen and nutrients it needs, and brain cells begin to die. Nearly two million brain cells die each minute a stroke goes untreated, which is why recognizing the signs early is so essential. Both McCrea and Dr. Baidwan point to the acronym B.E. F.A.S.T. as a great tool to help people understand and remember the telltale signs of stroke. 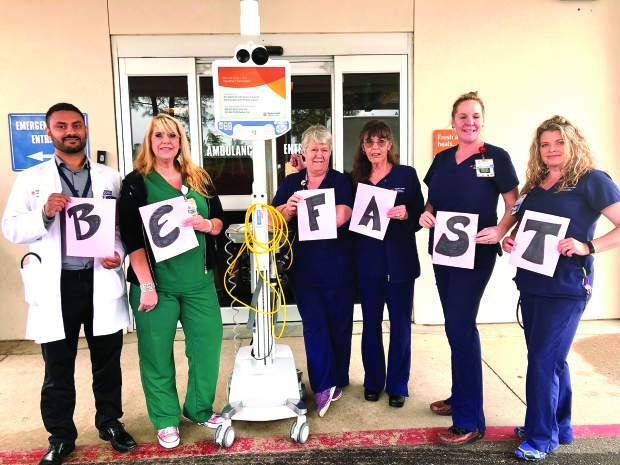 [See sidebar] “BE FAST” expands on the previously used “FAST” – adding two additional symptoms so that the acronym covers 95% of acute stroke symptoms. As a certified Advanced Primary Stroke Center, SNMH provides the community with comprehensive stroke care, following stringent guidelines set by American Stroke Association standards. SNMH is also part of the Dignity Health Neurological Institute, which provides a pyramid of care and includes the Comprehensive Stroke Center at Mercy San Juan Medical Center in Carmichael – the first and only Comprehensive Stroke Center north of the Bay Area. SNMH’s stroke program began in 2008, through support of the SNMH Foundation’s “Stroke of Luck” Campaign. Through gifts generated by the campaign, SNMH was able to provide for advanced stroke-specific education for nurses, technicians and physicians; initial stroke certification by the Joint Commission; and a telemedicine robot used for neurology consultations. SNMH became a Certified Primary Stroke Center in 2009, as recognized by the Joint Commission. Currently SNMH serves an estimated population of 99,000, of which approximately 24% are 65 years or older (a population at higher risk for stroke). This strategy is made possible through the SNMH Foundation and community support. While SNMH has been proactive in developing a stroke program that can provide care quickly and effectively, McCrea points out that the hospital’s stroke team must still rely on the community to take the first step.